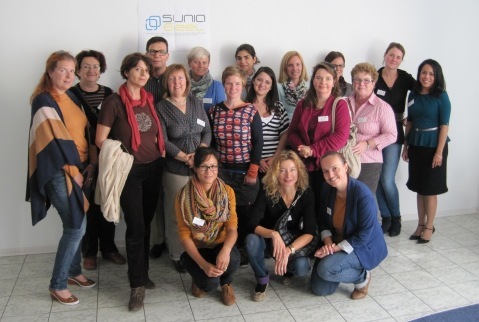 Verein Multikulturell, Exchange House’s Austrian Sunia Geel Partners, held a Service Provider Conference in Innsbruck to coincide with the transnational partner meeting of Sunia Geel. The conference brought service providers from the city of Innsbruck and the surrounding areas to present and discuss the services they provide to victims of domestic violence and their families. The Sunia Geel partners and the Service Providers forms working groups around these three topics and formed questions and solutions in the area of domestic violence. Part of the conference also included a visit to the Familiengerichtshilfe (Family and Child Court Support Service) to further explore the court assistance service they offer to women and children affected by domestic violence. All who participated found the conference to be hugely beneficial, taking away with them new insights and approaches to the various services they provide.